I awoke in terror, gasping. When I calmed down enough to breathe normally, I realized my hands were on my neck, as though protecting it. It was just before dawn. I gathered my belongings, and scurried out the door without a thought to breakfast. Better to be busy doing something, so my mind didn’t return to that awful memory. I headed up the path to Bleakfall Barrows to retrieve Lucan’ claw. The walk and the cool mountain air were exactly what I needed. I stopped frequently to admire the grandiose mountains. 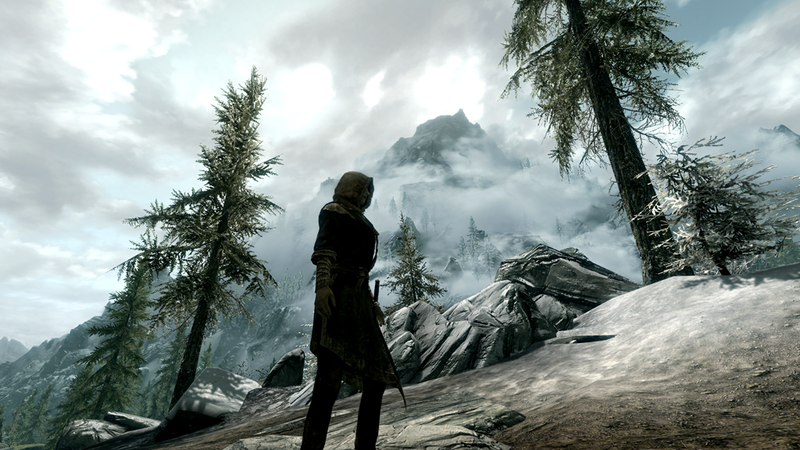 The descriptions and artwork of Skyrim did not do it the justice of seeing it for myself. Quite different than the coral seas where I came from. I enjoyed the differences. I picked as many flower samples as I could find. I needed more ingredients to experiment with. 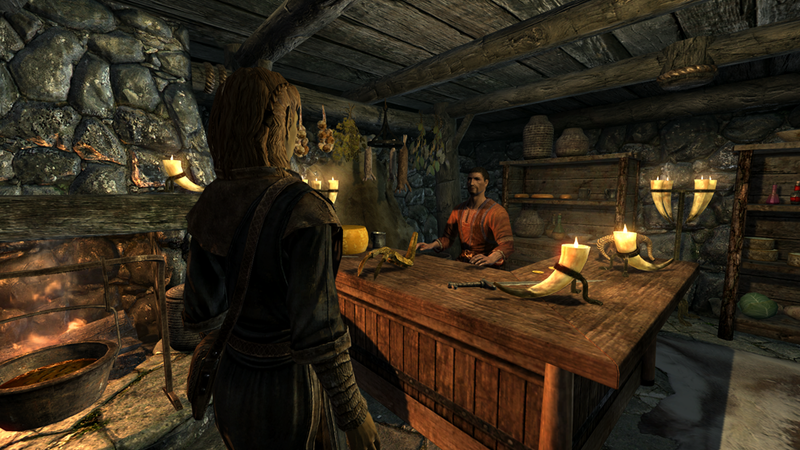 I only had a brief chance to dabble with potions at the inn. I ran into a few bandits and wolves on the way up. To be honest, I was quite nervous and clumsy with my first battles. 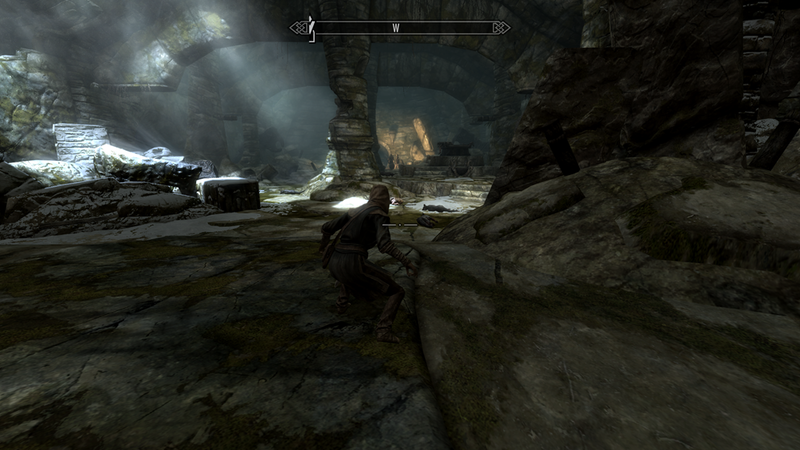 I knew a few spells known to all Altmer, but I never engaged in combat where my life was in danger. I trained in practice rounds only. I always felt my training was rigged so I would win. Meddling from my parents, no doubt. Teachers afraid of repercussions if I lost, or obtained too many bruises. I sneered at the memory. Inside the Barrows, I spotted bandits. I knew I was no match for two bandit warriors. I manipulated the mind of one to attack his companion, then finished the one left standing with fire. Continuing through, I caught up with the thief who stole the claw. The rest of the dungeon was mostly clearing awakened undead. Each successive kill dissipated any apprehension about battle. I amassed a decent supply of bone meal samples for experimentation. Near the end of the dungeon, I heard what sounded like…chanting. It seemed to be…calling me. 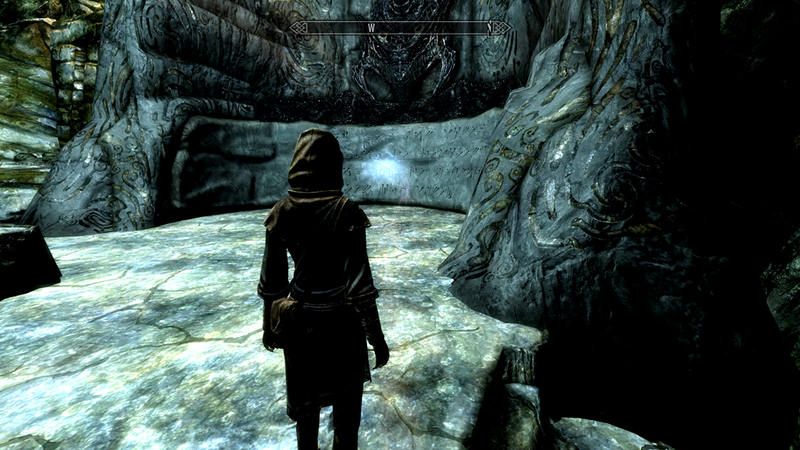 As I approached the source of the chanting on a strange, runic wall, something awakened in my soul. An alien language written on the wall. And yet…I understood the word. “Fus”. Force. How did I know this? I didn’t even know what language this was. And yet…I knew it. I knew the meaning of the word, but there was something more. Something missing. Intuitively, something clicked. The writing on the wall was why I came. It was not chance. A disconcerting thought passed my mind. The decision to come here wasn’t even truly my own conscious idea. Going to college in Skyrim – where had that come from? Why was I always fixated on that thought? I sacrificed a privileged life in the Summerset Isles. By running away, and the shipwreck events, I severed the ties to my past. I probably could have had any station I desired in the Aldmeri Dominion (if I submitted to their doctrine). Why, then, did Skyrim call to me? Skyrim. Cold. The people as harsh to outsiders as the landscape. Embattled in a civil war. High elves held in particular contempt due to the Talos worship ban. 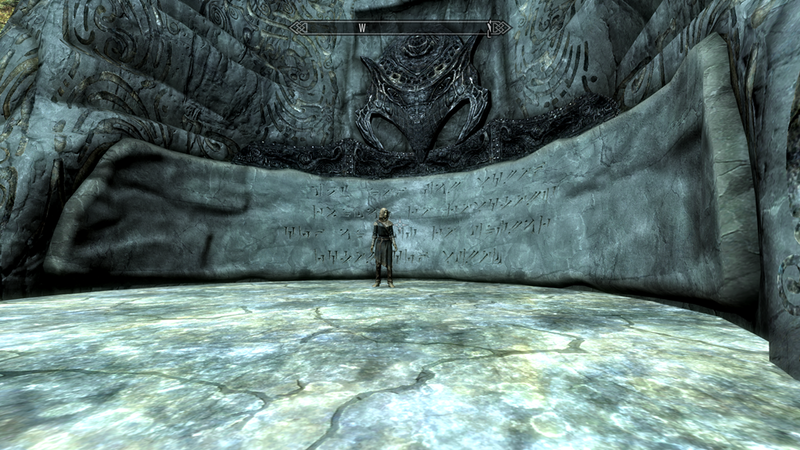 There was no logical reason for the daughter of hated Thalmor to attend school here. In truth, I didn’t agree with Thalmor politics (a great source of contention between my parents and myself). I didn’t involve myself in politics – I only wanted to study. Regardless, my lineage would do me no favors. I always knew that…and yet…I couldn’t resist. Couldn’t. Skyrim called to me the same way as the words on the wall. If it were a purely logical reason, I wouldn’t be here. I was…summoned. My answer, written on the wall. I just needed the cypher to understand it. Pondering all this, I returned the claw to a most appreciative Lucan. I heard stories of the Nord’s dislike of outsiders. Thus far, I found they judged me based on my deeds. I can make this work. I rented a room at the Sleeping Giant Inn again. Traveling to Whiterun on the morrow. I couldn’t help thinking about the words on the wall. 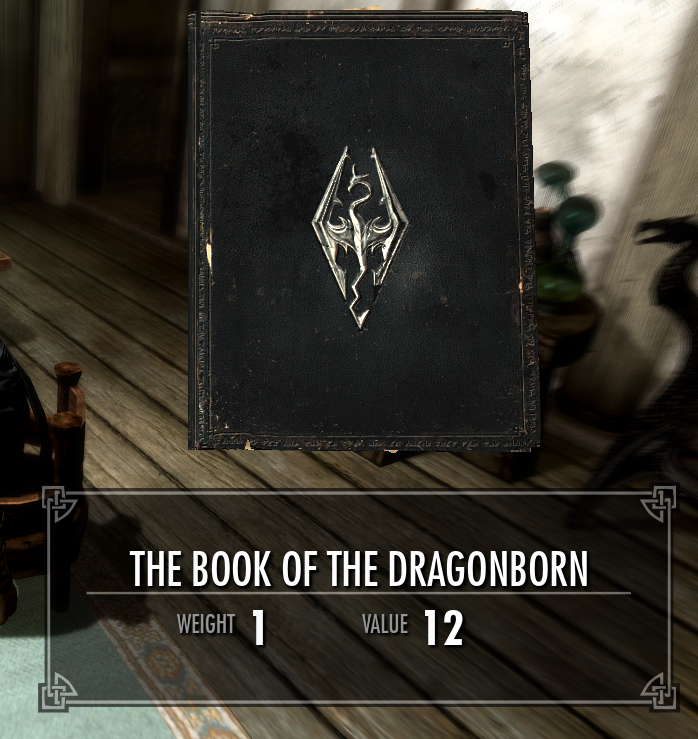 I thumbed a book I took from Helgen titled, “Book of the Dragonborn”. I had not a chance to read it yet. I opened and read it now. I recognized the name “Weynon Priory”. It was a significant setting during the Oblivion crisis. It housed the Amulet of Kings briefly, before it was stolen. The Hero of Kvatch frequently used it as a base of operations when closing the Oblivion gates. I felt a tingle like static electricity. Coincidence? My namesake was the Hero of Kvatch. Also an Altmer mage. Also Azeriah…with no known last name. I stood up immediately, and paced the room. My heart raced. The light on my candle flickered as though trembling in a breeze. The candle held steady, but a book fell off the shelf next to me. So close to the answer. Laid down, but unable to sleep. Excitement of near revelation? Or fear of nightmares?